Proverb: "Don't make a custom or break a custom". The tradition is very much on the wane now but in some few localities Wrenboys still go out in Ireland on St. Stephens Day (English Boxing Day). The central theme of the wrenboy visit is the wren, an effigy of which is carried about in a holly branch or in a box or cage. Previously it was hunted and killed prior to St. Stepen's Day and a matter of honour for groups to have a real bird. Why, of all birds, is the inoffensive little wren chosen as the martyr for display by groups who take their name from it? Because of its treachery, some claim! When the Irish forces were about to catch Cromwells troops by surprise, a wren perched on one of the soldiers drums made a noise that woke the sleeping sentries just in time, thereby saving the camp. Another explanation is that it 'betrayed St. Stephen, the first Christian martyr, by flapping its wings to attract his pursuers when he was hiding'. More say the hostility towards this most harmless of creatures results from the efforts of clerics in the middle ages to undermine vestiges of druidic reverence and practices regarding the bird. Medieval texts interpret the etymology of wren, the Irish for which is dreolín, as derived from 'dreán' or 'draoi éan' the translation of which is 'druid bird'. Wrenboy ceremonies, with different forms of verse to Ireland, were popular in France, England and the Isle of Man. There were other cultural differences too in that the wren was hunted in England but not in Scotland. In France, the first person to kill the bird was king! Except for the ritual killing on St. Stephen's Day, it was universally regarded as unlucky to injure the wren at any other time or to rob its nest. Where the tradition survives today a fake bird is always used. 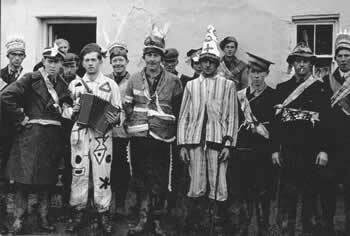 In Munster, particularly in Co. Kerry, the Wrenboys ritual is almost as elaborate as the Mummers. The associated drama performed in Dingle at one time incorporated ceremonial group combat. The play was thought to be very ancient, ‘possibly dating back to the second millenium B.C.’. Here, a Captain is dressed in a sort of uniform carrying a sword. There is another character called the amadán and an óinseach or female jester. A wooden frame resembling a horse, called a láir bhán (white mare), is carried on the shoulders. In some places, names are given to the characters, as in the Mummers, and a mock battle held between one group with wooden swords and another with large bladders tied to sticks. In Sligo and Leitrim masks are an important part of the tradition in Mumming as well as the Wran. Accounts survive of two different sets of wrenboys who went out in Ballinamore, Co. Leitrim, in the early 1900's. One group consisted of five to fifteen year olds. The other was composed of grown-ups. The grown-ups were more professional. They went out in batches of ten or twelve dressed in old trousers made of calico or curtain cloth. Coats were made of the same material. Hats with feathers or red handkerchiefs were worn on the head. 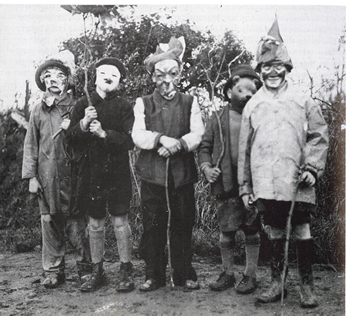 False faces similar to that worn by the younger Wrenboys concealed their identity. Sometimes horse hair was worn on the hat or attached to the false face to look like whiskers. Eyewitnesses wrote that, 'there was a great splash of colour about them'. In compliance with laws in force at the time the man with the money box always went unmasked. 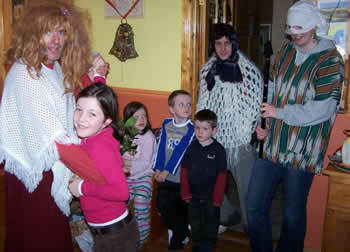 On St. Stephen's day was caught in the furze. So rise up landlady and give us a trate. Your soul in heaven can find its rest. It won’t plaze the boys at all. And give us a penny to bury the wran. Sometimes the lines, ‘We chased him from bush to bush and from tree to tree, and in Donnelly’s Hollow we cracked his knee’, were included. The proceeds of the collection was spent on a party called a ‘Join’. Picking a house for the shindig, a barrel of porter was bought for the men and wine for the ladies. Jam, currant cake, bread, sugar and lemonade was provided for everyone. A 'great night of sport and fun, dancing and music', followed that lasted until morning. A Tullaghan, Co. Leitrim man, who went out with a mummer band in West Fermanagh in 1911, recalled that they were generally made welcome. However, ‘in a few places dogs were set on us and in one place we were fired on’. They were required to have 'a line', written permission, from the local Justice of the Peace. R.I.C. patrols often challenged them to produce this as evidence of their 'authority’. Over three nights they travelled a distance of thirty miles during which they accumulated ten pounds. This they spent on stout and minerals for their Mummers Dance. They had two pounds left over which they gave to a poor woman in the locality with no means. Mummers and Wrenboys still collect money at the end of their visit; they still hold a ‘Join’ or 'Mummers Ball' after the holidays. It's increasingly difficult to get participants in Sligo/Leitrim to wear disguise in the traditional manner and most groups don't go from house to house anymore but to pubs and other places where large crowds gather. The transition has been forced by migrations in rural populations almost as great as those during the famine of the 19th century. Lifestyles too have changed dramatically. 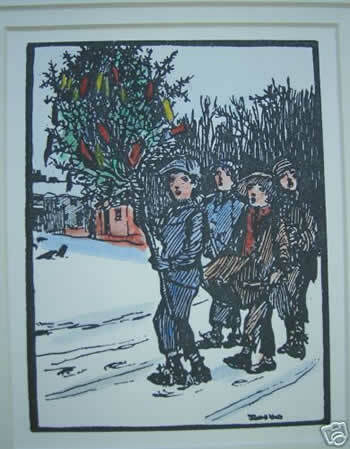 For mummers doing the rounds in the fifties it was a short walk from house to house, each home filled with young and old. Now, silence pervades the lonely roads; the step of carefree feet, the ring of laughing voices; the joyous faces that filled the welcoming kitchens, are gone. Yet, Mummers and Wrenboys survive. Pub or house, where people gather they follow although not so much anymore and not in traditional dress. Nursing and retirement homes are entertained at least once over the holiday season. Especially important is a visit to houses where there are young children so they can experience the magic of Mummers and Wrenboys, and remembering the merriment, carry on this oldest of traditions. 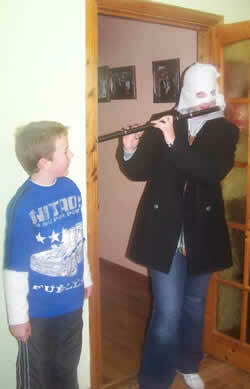 A particularly enthusiastic welcome is given to performers in rural areas. Perhaps atavistic resonances survive here of ancient death and revival ceremonies, rituals that were as important as life itself to men and women who lived by the soil and the capricious whimsy of unseen gods. Do country dwellers harbour ancestral memories of deities that in a dark past required not just ceremony but sacrifice as well? Now, the Mummer and Wrenboy tale is nothing more than a diversion, an exhibition of outrageous fantasy, commonsense turned on its head to relieve the gloom of short, dark days. Who can resist a festive invitation to dress in absurd costumes, don ridiculous masks and headdress, and go about from place to place unrecognised; free spirits of the otherworld or any world bursting upon an unsuspecting audience with song, music and dance. This lively custom is sprung from the hearts and hearths of country people. Remarkably it has withstood the challenge of packaged entertainment. The Wrewnboys revive each year. Like the mythical phoenix they burst forth from the fireplaces and spark the ancient revels. Dressed in bizarre and colourful garb they storm houses and meeting places, bringing a whirlwind of high spirits for a short while to the lucky occupants. 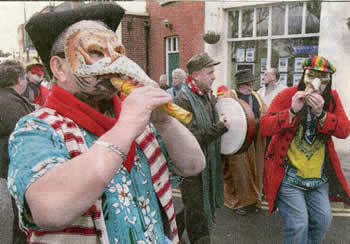 Don't miss the Mummers or Wrenboys next year when they call forth the shades of Christmas past! The Year in Ireland, Kevin Danaher, p246. Journals of the Kildare Archaeological Society, V, 452.